My students have gotten me into watching American Horror Story: Coven this season. Although it’s only in the third or so episode, I must admit it’s intriguing. It’s entertaining…and it deals with the occult. Okay, to be honest, it sensationalizes the occult. 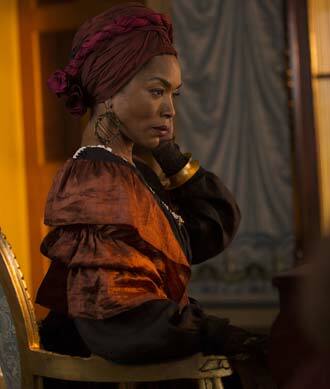 One thing I like is Angela Basset’s character, the famed New Orleans Voudun Priestess Marie Leveau. She’s written as an occult witch who actually seems to protect the Africana community from supernatural threats. Nevertheless, the occult is made exotic and titillating for media consumption. Among other reasons, I wanted to give people a better understanding of Black occult practices. There are some who would engage in “conjuring,” but many would sooner give you an herb that cleans the blood, a meditation exercise to clear stress, or even some historical information that would clarify a religious or ideological dilemma. Below is a video of a great teacher of Black Gnostic Studies in LA, the late Dadisi Sanyika. Dadisi has likely taught thousands over the decades (certainly hundreds). I am also a student of his, and am posting this to both further illustrate what Black Gnosticism is, but also to honor his legacy. ~ by Lord Amaru on November 3, 2013.